How to backup and compress Blu-ray movies on computer? Nowadays, more and more people own Blu-ray Discs. Do you have the same problem on how to backup your Blu-Ray Discs to computer, apple TV, or iPhone, iPad and iPod, so that you can enjoy the high quality movie on living room or on travel without taking many discs? Acrok Video Converter Ultimate will be able to help you to remove part of Blu-ray protections to achieve it. Benefit from the multi-core CPUs, and GPU acceleration with NVIDIA CUDA and AMD technology, Blu-ray ripper with 10X Speed Promotion will help you to save much more time to enjoy the Blu-ray movies. Guide: How to backup and compress Blu Ray movies? 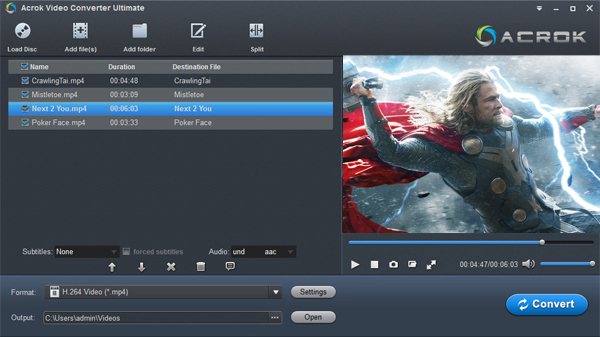 Tool Required: Acrok Video Converter Ultimate – Can help you rip and convert Blu Ray Disc movies to almost all popular video formats: MP4, WMV, MOV, AVI, MPEG, FLV, DivX, VOB, SWF, TS, HD Video, etc. Mac users please download the Acrok Video Converter Ultimate for Mac. Now, let’s start to backup our Blu Ray Discs to PC using the Blu Ray Ripper. Step 1: Download Acrok Blu-ray ripping software. Install and run it. Step 2: Click “Load Disc” icon to load your Blu Ray Disc movies into the program. Step 3: Set output settings. Select the files need to be converted and click “Format” button to select the output format in the drop-down list. Here, you can choose H.264 MP4 as output format. This profile can help you commpress Blu-ray movies. Tip: If you want to backup Blu-ray movies to computer, you can Click “Format” > “Disc Copy” > “Directly Copy-(Only for Blu-ray/DVD)” or “Full Disc Copy-(Only for Blu-ray/DVD)”. Step 4: Backup Blu Ray movies to PC. After finishing the above settings, check the files needed to convert in the file list, and click “Convert” button to start the process.